Drug and alcohol addiction treatment programs are designed to help you escape a compulsive cycle of alcohol or drug abuse that represents a loss of control over your substance use.1 To these ends, treatment programs teach you how to function in everyday life without using your substance of choice. Treatment is often needed to address drug or alcohol addiction because, quite simply, it’s incredibly difficult to successfully quit on your own. You need guidance to understand the reasons for your behavior, to learn alternatives that can help you change your behavior, and to be guided into a new and healthy lifestyle. Going to treatment give you access to professional substance use disorder treatment specialists who are specifically trained in methods that effectively deal with these issues. How invested you are in changing. Some people feel forced into treatment and see no need to stop using drugs or alcohol—they simply feel unlucky to be put in a position to have to enter treatment. Other people understand that they have a problem, but are not ready to stop using drugs or alcohol, and may not actually see their substance use as a serious enough issue to warrant treatment. Some people may have accepted the fact that they have a severe problem with drugs or alcohol and are ready to do what it takes to address this problem. Good treatment programs meet you where you are and help you move forward. How much positive social support you have. Positive social support is integral to the success of your treatment program, as well as essential in helping you maintain your focus after treatment. It is important to have family, friends, and others involved in your treatment process through family therapy or going with you to social support groups, such as 12-step groups like Alcoholics Anonymous. Whether you have any other medical or psychological issues. While in treatment for a substance use disorder, you need to be treated as an entire person. This means addressing co-occurring psychological and medical issues, as well as adjusting your program for you —there is no one-size-fits-all approach to competent treatment. Who is conducting the treatment. A professional treatment program run by professional and skilled treatment providers is essential in treating substance use disorders. 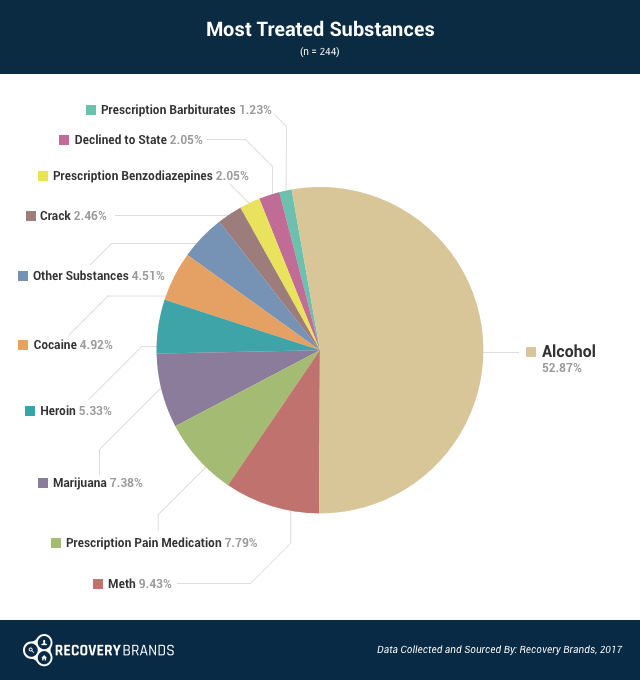 Ethanol, or alcohol, is the top substance of abuse among those who attend treatment, as a 2017 Recovery Brands survey reports. 68.85% of people that took the survey underwent treatment for alcohol abuse, and almost 53% of respondents said that getting help with a drinking problem was their most common reason for seeking treatment. No matter how many substances of abuse people receive treatment for, the most worrisome one is alcohol. Luckily these days, alcohol abuse treatment is very accessible. Have I told myself that I will cut down or quit using alcohol or drugs, but just never seem to want to do it or to get around to it? Is my drug or alcohol use getting in the way of my relationships with people who are important in my life? Do any of these people complain about my drug or alcohol use? Do I like using my drug of choice or alcohol so much that I never stop using it until it is almost all gone? Since I have been using alcohol and drugs, has my performance at work or at school gotten worse? Do I use drugs or alcohol when I am stressed out? Have I ever used drugs or alcohol in situations where it could be dangerous, such as driving a car, using drugs or alcohol at work, using drugs or alcohol while watching small children, or other similar situations? Do I find myself thinking about using drugs or alcohol often, such as once or twice a day? Does it take more of the drug or alcohol to give me the same effect I once got? If a friend or family member mentions to me that I may have a problem with drugs or alcohol, do I become very defensive? Do I find if I haven’t used drugs or alcohol for a while that I experience any of the following: mild nausea, nervousness, irritability, shakiness, headaches, depression, or anxiety? Do I attempt to use drugs or alcohol again to counteract these feelings? If you honestly answered yes to two or more of these questions you may have an addiction to drugs or alcohol. Opiate and opioid drugs, such as morphine, heroin, Vicodin, and OxyContin, are also associated with powerful physical dependence and a severely unpleasant withdrawal syndrome. While the symptoms of acute opioid withdrawal do not generally pose significant health risks, they can give rise to troublesome complications, such as dehydration and heightened pain sensitivity. More serious potential outcomes include depression with suicidal thoughts, as well as increased risk of relapse in an attempt to stave off unpleasant withdrawal symptoms. Many times, people detoxing from opioids are stabilized with replacement drug therapy, including the judicious use of FDA-approved medications such as buprenorphine or Suboxone—partial opioid agonists that occupy the same brain receptors as opiates to minimize withdrawal; doses are then slowly tapered down. Treatment for alcohol use disorder often begins with an inpatient detox program where you receive supervision in safely withdrawing from alcohol. Medications such as benzodiazepines can be prescribed to help with this process, and inpatient care provides the benefit of around-the-clock observation in case you have any complications. Using benzodiazepines is a standard practice in treating alcohol withdrawal, but this form of medical management should only be administered by a licensed physician trained in addiction medicine.5 People with milder levels of physical dependence may be managed on an outpatient basis, but this decision should always be made by a physician. When you have a polysubstance addiction, it becomes more complicated to zero in on the right treatment. If you are abusing alcohol and other drugs, then you clearly need to be treated for all of your addictions, which may require a vigilantly supervised period of detoxification and withdrawal, wherein specific interventions are mapped out and begun for each drug of abuse. After detox, you would then enter a period of active rehabilitation or treatment like those described above and attend specific group, individual, and social support group interventions designed to address each of your issues. It’s also possible that you may have concurrent psychological and medical issues—or what’s known as a dual diagnosis—which would then need to be treated along with your substance use disorders.5 A comprehensive drug and alcohol addiction treatment program should be able to competently address each of your presenting issues. Upon completion of your inpatient program, your treatment team may advise you to step down to an outpatient program, which allows you to live at home while attending groups and therapy 3 to 5 days a week. Peer support groups such as 12-step programs are often an important component of an outpatient program—and one you can take with you into the aftercare phase of your treatment. American Psychiatric Association. (2013). Diagnostic and Statistical Manual of Mental Disorders, Fifth Edition. Washington, DC: American Psychiatric Publishing. Sevarino, K. (Ed.). (2013). Treatment of Substance Use Disorders. New York: Routledge. Miller, W. R. & Rollnick, S. (2012). Motivational Interviewing: Helping People Change. New York: Guilford Press. Miller, W. R. & Heather, N. (Eds.). (2013). Treating Addictive Behaviors: Processes of Change (Vol. 13). New York: Plenum Press.